The Pause in global temperatures may be past, but here is another, longer Pause, and one that is much more difficult to explain: at ideal Australian sites, increasing greenhouse gas concentrations have led to a decrease in downwelling longwave radiation- the very opposite of expectations. Basically, the theory behind the enhanced greenhouse effect is that the increase in concentrations of anthropogenic greenhouse gases leads to an increase in downwelling infra-red (IR) radiation, which causes surface warming. Is there evidence for increasing downwelling IR in recent years, as atmospheric concentration of carbon dioxide has been rapidly rising? The links in the above quote do not work for me, so I use data available for Australia. The Cape Grim station is positioned just south of the isolated north-west tip (Woolnorth Point) of Tasmania. It is in an important site, as the air sampled arrives at Cape Grim after long trajectories over the Southern Ocean, under conditions described as ‘baseline’. This baseline air is representative of a large area of the Southern Hemisphere, unaffected by regional pollution sources (there are no nearby cities or industry that would contaminate the air quality). Fig. 2: CO2 concentration, Cape Grim. Fig. 3: Methane concentration, Cape Grim. Fig. 4: Nitrous oxide concentration, Cape Grim. There is no doubt that concentrations of greenhouse gases have been increasing. We should therefore expect to see some increase in downwelling longwave radiation. Downwelling IR data are available from the Bureau of Meteorology which maintains a database of monthly 1 minute solar data from a network of stations around Australia, including Cape Grim. What better location than Cape Grim to study the effects of greenhouse gas concentrations from month to month on readings of downwelling IR. The instruments are within metres of each other under “baseline” conditions at a pristine site. The data include 1 minute terrestrial irradiance (i.e. downwelling IR striking a horizontal surface) from which I calculated mean daily IR for each month. To remove the seasonal signal, I calculate anomalies from monthly means. Fig. 5: Downwelling longwave radiation anomalies, Cape Grim. Fig. 6: Downwelling longwave radiation anomalies, Cape Grim. In the most suitable location in Australia, from May 1998 to June 2018 there has been no increase in downwelling infra-red radiation, despite an increase of 41.556 ppm atmospheric concentration of carbon dioxide, 104.15 ppb of methane, and 14.472 ppb of nitrous oxide. So what factors do influence downwelling IR and thus surface warming or cooling? Together with solar radiation, that other greenhouse gas, H2O. Gaseous H2O (humidity) and clouds formed of liquid and ice H2O are by far the major players in returning heat to the surface. We see this in a plot of downwelling IR against cloudiness (from nearby Marrawa). Fig. 7: Downwelling IR anomalies vs Cloudiness, Cape Grim. Daytime cloudiness (an average of observations at 9.00 a.m. and 3.00 p.m.) increases downwelling IR. We have no data for night time cloudiness unfortunately. To illustrate the irrelevance of carbon dioxide, here is a plot of anomalies of solar radiation (global irradiance), downwelling infra-red radiation, daytime cloudiness, and carbon dioxide concentration at Cape Grim over the past 20 years. There is a feedback mechanism: cloudiness inhibits daytime temperature and increases IR and nighttime temperature; decreased cloudiness means decreased IR; but less cloud and higher daytime temperature will increase IR as well if sustained; and higher IR also increases daytime temperature. Further, sustained decrease in global radiation due to increased cloud cools the surface, thus decreasing IR. Carbon dioxide concentration changes have no detectable effect. A desert location, where humidity is typically very low and rain and cloudiness very infrequent, would also be ideal for checking on downwelling IR from carbon dioxide. Alice Springs in the central desert is such a location with available irradiance data. At Alice Springs as well, since March 1995 downwelling IR has been decreasing. Fig. 10: Downwelling longwave radiation anomalies, Alice Springs. The relationship between cloud and IR is even more evident. Fig. 12: Downwelling IR anomalies vs Cloudiness, Alice Springs. Cloudiness has an even greater influence on IR in desert than maritime locations. TAKE AWAY FACT:- For over 20 years, at what are arguably the most suitable sites in Australia, increasing greenhouse gas concentrations have had no detectable effect on downwelling longwave radiation. Natural factors including cloudiness changes have vastly overwhelmed any such effect and have instead led to a decrease in downwelling longwave radiation. That is indeed a most inconvenient pause. You will need to register with a username and password. Then click on an irradiance observation station. Select year and month. Download the zip file, and open in your preferred application. (I use Excel). IR data are in Column W- the values are wattminutes of IR striking a horizontal surface of area one square metre. My method: Order the data in ascending order to remove null values. Count the minutes of valid data and calculate the percentage valid of all possible minutes in that month. (I discard months with less than 80% valid data.) Divide the total minutes by 1,440 to convert to days. Sum the valid data and divide by 60,000 to find kilowatthours; divide by the number of days to find the mean daily value; then multiply by 3.6 to convert to Megajoules. Plot monthly values against time or carbon dioxide concentration. Climate scientists assert that increasing concentrations of carbon dioxide and other greenhouse gases in the atmosphere have caused and will continue to cause global temperature to increase. Real world evidence to support this is sadly lacking. I use CO2 data from NOAA at Mauna Loa and HadSST3 Sea Surface data to compare both over the same period, as oceans cover most of global surface. There have been 60 years of continued and accelerating CO2 increase. 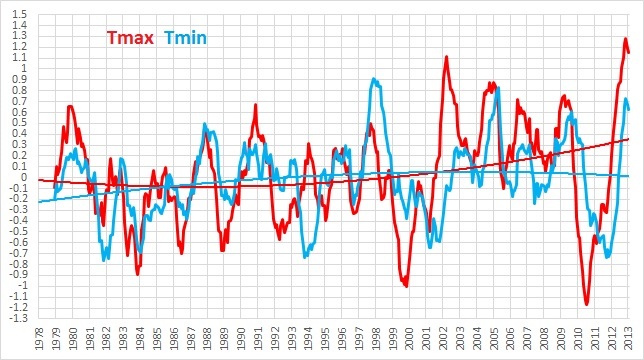 While you may note the distinct lack of warming before the mid 1970s, and that although a quadratic trend line fits the data, the increase is not smooth but a series of steps with some large spikes at about the time of ENSO events, climate scientists insist that it is the overall trend that is important. The following plot appears to support the greenhouse warming theory. It seems that nearly three quarters of the temperature change since 1958 can be explained by the increase in CO2 concentration. This accords with the theory. But what if we reverse the axes in Figure 3? It is equally valid to propose that nearly three quarters of the increase in carbon dioxide concentration can be explained by increasing sea surface temperatures, although that is not the point of this exercise. To determine if CO2 is the cause of increasing temperature, or vice versa, we need to compare SST anomalies and CO2 concentration as a function of time. If SST and CO2 both change at the same time, we are no further advanced, but if CO2 changes before SST (due to thermal inertia of the oceans), then that would be evidence for CO2 increase being the driver of temperature increase. Both CO2 concentration and SST anomalies have pronounced trends, so for comparison both datasets are detrended, and the large seasonal signal is removed from CO2 data to calculate monthly “anomalies”. Remember, it is increasing CO2 which is supposed to cause increasing temperature, not a static amount, so change in CO2 and SST must be our focus. My measure of change in SST and CO2 is 12 monthly difference: for example January 2000 minus January 1999. The next plot shows 12 monthly difference in both SST and CO2 anomalies from 1959 to 2018. (SST is scaled up for comparison). There appear to be differences in some decades- the lag time varies from four months to eight or nine months. Correlation co-efficient of 0.57 is not bad considering we are comparing all ocean basins and the atmosphere. As SST change generally precedes CO2 change by about seven months (sometimes less, sometimes more), there is NO evidence that CO2 increase causes temperature increase. But we are still left with the increase in CO2 from 1958 while SST paused or decreased for 19 years. While it is difficult to attribute decadal CO2 increase to non-existent SST rise, there is no evidence for CO2 driving temperature increase in this period. However, plotting 12 month change of CO2 and SST clearly reveals their relationship. It is clear that 12 monthly change in temperature drives 12 monthly change in CO2 concentration. The continual rise in CO2 from 1958 to 1976 while SST declined indicates there must be an underlying increase in CO2 unrelated to immediately preceding temperature, but there is definitely no evidence that it causes sea surface temperature increase at any time. Increase in CO2 concentration is supposed to be the cause of the increase in temperature we see in the SST data (and satellite data). However, analysis shows that CO2 changes about four to seven months (and longer) after sea surface temperature changes. Therefore, atmospheric CO2 increase cannot be the cause of surface temperature increase. Real world data disproves the theory. ACORN-SAT- the gift that keeps on giving! Unfortunately for doomsayers, the fact that 2013 was the hottest year on record in Australia is no evidence for the effects of greenhouse warming. In fact, it is the very opposite. Once again I am using data straight from the Bureau’s website. Sorry, but this is not evidence of greenhouse warming over the period of the satellite era, when greenhouse gases have been increasing rapidly. It is merely evidence of warming.